Want to buy La Ru goods in person? Are you in Seattle? Stop by my shop in downtown Seattle called Ugly Baby and La Ru. New Seattle Robot Shirts are in! These will soon be added to the online shop. In the meantime you can pick one up at Ugly Baby and La Ru. Women's in Teal, available in sizes XS - XL. Men's in Steel Gray, available in S - XL. Three new La Ru tote bag designs. Pick one up at Ugly Baby and La Ru. These will be available online shortly. They are 16x16x4" canvas tote bags. 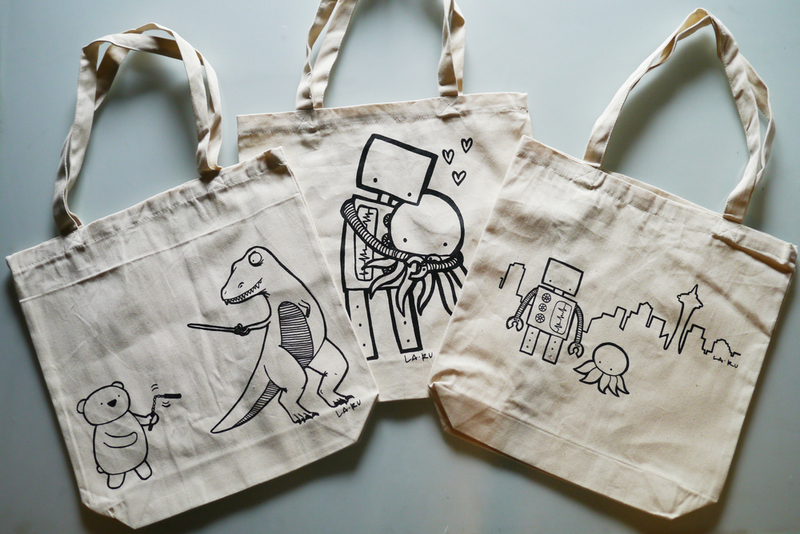 Three designs: Polar Bear vs T-Rex, Robot Hugging Octopus, and Seattle Robot.